Victor's Quest is a separate adventure set in the world of Floramonde. Prince Victor first turned up in a story called Betony's Sunflower, which became the last chapter of my first book The Willow Tree's Daughter. He was one of a number of princes that Princess Betony's father wanted her to marry. She set them a task, and all of them failed - the other princes because they weren't very nice people, Victor because he was stupid. After it was published, I found that I was worried about Victor. It didn't seem fair to me that he should be unhappy just because he was stupid. So I wrote him a book of his own so he could be happy. And he is. 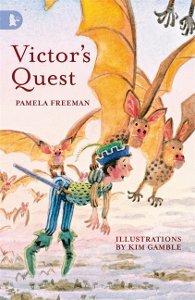 However, Victor's Quest has been the most popular of my books, and I've had lots of requests for more stories about Victor. So I have written a new story, Victor's Challenge, which will be published by Walker Books soon. Check the News page for updates. and has to be put together with a screwdriver! But is Ruff the Wonderdog better than a living, breathing, loving animal? I am allergic to dogs but I really quite like them, and this story is a kind of wish fulfilment. I wrote it while I was pregnant and my main memory of writing it is trying to reach the keyboard over my big stomach! I like the characters in this story so I wrote another short story about them called Which was against the Rules. This was published in The NSW School Magazine in 2007. See Teaching Resources to download a copy of this story. Megan has always wanted to be a flowergirl. She knows she would be perfect at it. Now her Aunty Kat is getting married. Is it Megan's turn this time? This is my only book which is based on my own life. I was married in 2000, and my then 14-year-old niece, Megan, wanted to be my bridesmaid. She really wanted to be my bridesmaid, and did everything she could to convince me that I needed a bridesmaid (I wasn't going to have one), including making a speech about it at a family dinner. How could I say no? So when my editor at Scholastics asked me if I could write a story for younger readers that was based on 'real life' I decided that Megan's desire to be in the wedding party was a good starting point - but because the book was for younger readers I made her 6 instead of 14, and a flowergirl instead of a bridesmaid. That's the only part of the story based on the truth, however. Megan is not clumsy; I do not come from a big Italian family (I only have two sisters and one brother); my veil did not fly off. But Megan was the perfect bridesmaid, just like the Megan in the book! Alex and Di are excited when Nanna comes to live with them. I wrote Nanna because some kids I know told me they were sick of seeing wonderful grandparents on the TV because theirs weren't wonderful at all (at least, one pair of them weren't). That started me thinking about how grandparents are presented in the media and how rarely you see an old person who isn't, deep down, a nice person. But why should people become nice just because their children have had children? I was also a bit sick of all those sitcoms and movies where the family conflict is all patched up in the last scene and everyone lives happily ever after. So I wrote a story about a Nanna who was not nice, not really, and about a family who dealt with that in a real way. 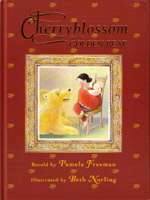 Cherryblossom and the Golden Bear is a retelling of a traditional tale. I first read it in the version 'The Woodcutter's Daughter' by Alison Uttley. I loved the image of the bear coming out of the fire. That version is much longer and much scarier than the one I told, as it was for older readers. There are lots of different ways to tell the same story, and some stories, such as Cinderella or Snow White or The Gingerbread Man are retold many, many times in many different ways. It was hard to make Cherryblossom and the Golden Bear shorter. My first draft was 5000 words; my last draft was 600 words! In between we did about 8 other drafts, including one where the editor and I sat down with the illustrator, looked at the pictures, and decided which words could be cut out because that part of the story was told in the pictures. We don't know exactly where this story is from, but we thought it was probably Russian or Scandinavian because of the bear. The illustrator, Beth Norling, decided to set it in Russia in the olden days because she thought the folk art from that time and place was beautiful and she could use it in her pictures. Beth won an International Books for Young People award for the illustrations. Click here for more information about Beth and her work.